The manager at a Denny's restaurant in Brooklyn Center, Minnesota, reportedly wrote a message on the receipt of a patron who choked on her meal -- but it was one that was far from kind. As you all know my mom has had a few surgeries recently on her esophogus. She has trouble eating, swallowing and even keeping things down. She chokes when she eats and eating any meal is a process to her. To have a little normalcy in her day, she went to Denny's in Brooklyn Park, to try to eat on Monday afternoon. 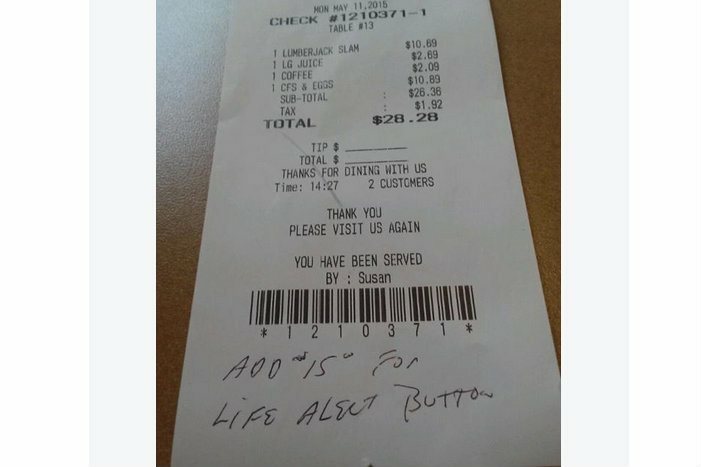 This is what the Manager, yes the Manager wrote on her bill! 'Add $15 for Life Alert Button" I cannot begin to describe the disgust and the rage I am feeling. I'm so very sorry mom!! Quigley wouldn't provide comment to the Daily Meal, but Saba said the owner of Denny's told her the manager would receive a "write-up" and retraining, but added that he couldn't be fired because of his longtime employment. The chain restaurant offered the family a free meal and a reimbursement. She claims Quigley did call her and apologize, but her sister, Caroline Speikers, reportedly received a phone call from the restaurant's owner maintaining that Quigley had been joking. The owner claimed that Quigley was actually referring to the 60-year-old waitress who served their mom, whom he said "could get hurt by running around so much." Saba and Speikers told the Daily Meal that they don't believe the owner's excuse and that, even if it is true, it's a blatant example of age discrimination and doesn't excuse Quigley's behavior. "Either he's mocking someone who is ill and disabled, or he's totally comfortable discriminating against someone's age," Speikers said. "He has a sick and twisted sense of humor, and should not be allowed around customers." This isn't the first time Denny's in Brooklyn Center has been in the news. In 2014, two men were shot just outside the restaurant, just one week after a third man was shot in the wrist at the same location, reports KMSP-TV.